In this era of pig fetishization, the rustic Italian dish of porchetta — long-roasted pork, heavily laced with fennel and garlic, a carapace of burnished, crispy skin — is uber-trendy, on the menus of half the gastropubs in town. But the chef has been making it since 2015 at Lechons City, his equally rustic Italian market-deli in Los Angeles, where you can buy it by the pound or the slice, plated with lime-green salsa verde, or in sandwich form — as the chef had it as a kid, served by food trucks in Naples. Chef's iteration of the dish is classic: a pork loin, heavily seasoned and wrapped with pork belly, then roasted at high temperature for hours on a bed of large chunks of carrots and onions. It's a glorious, lacquered mosaic of pig, a dish that will make you utterly happy for many reasons. 4923 Eagle Rock Blvd., Los Angeles, CA 90041. (818) 263-9726, porchettaman.com. I’ve been waiting a long time to make a porchetta. Ever since I had the porchetta sandwich at Roli Roti, I knew I had to try making it at home. I’m making a porchetta instead of the same ol’ traditional ham or turkey this holiday. This porchetta came out ah-mah-zing. Salty crispy pork skin so delicious you could eat them like chips and juicy tender interior. 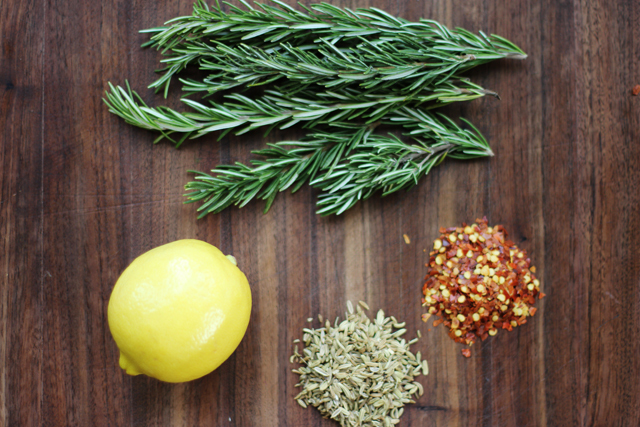 I used classic Italian flavors here, a mix of fennel, rosemary, garlic and lemon zest. 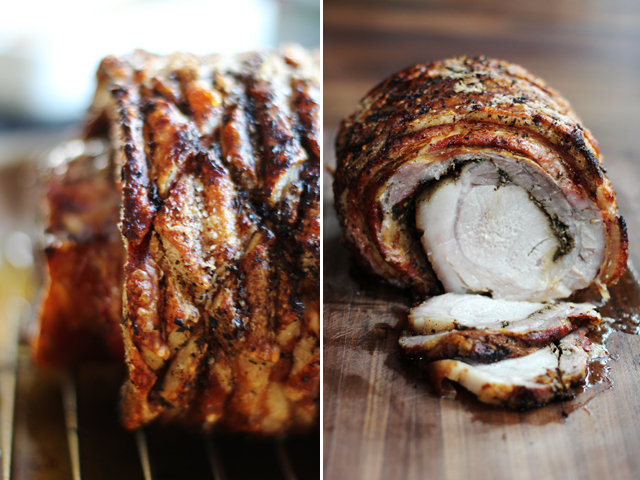 The key to porchetta is the moist interior and crispy skin. To achieve maximum crisp, the skin must be as dry as possible so I left the pork out for two hours at room temperature before roasting and only seasoned the skin with salt right before roasting. Leaving the salt on the skin for a while draws out all the moisture. Some butchers will be able to provide you a porchetta cut, which is the belly attached to the loin. If they don’t have it, buy the separate cuts and simply roll the belly around the loin. Ask for a rectangular slab of skin-on pork belly, about 5-6 pounds and a bone-less pork loin about 3-4 pounds. You may need to trim here and there to ensure the belly fits around the loin. I paired this porchetta with a light peppery arugula-parlsey gremolata and roasted rosemary potatoes. This is also delicious served on ciabatta bread as a sandwich. Basically, it’s everything you imagined it to be. 1 10-15 pound porchetta roast (or 1 rectangular slab of pork belly with skin on and 1 center-cut pork loin). I used a 10 pound porchetta here. In place of a whole pig, Asian Porchetta Toscana is made using tender pork loin, seasoned with garlic and classic Tuscan herbs: rosemary, pepper, laurel, sage and juniper. Rolled and bound in a layer of pork belly, our Asian Porchetta Toscana is steamed for an hour to maintain moisture, and then slow-roasted in dry heat for an additional nine hours. This unique two-step cooking process produces irresistibly succulent pork, with an exceptionally flavorful taste. The day before you plan on serving the porchetta, marinate the meat. Toast the fennels seeds, peppercorns and red pepper flakes in a pan on medium-high heat until they are toasted and fragrant, about 5 minutes. Keep them moving constantly to prevent them from burning. 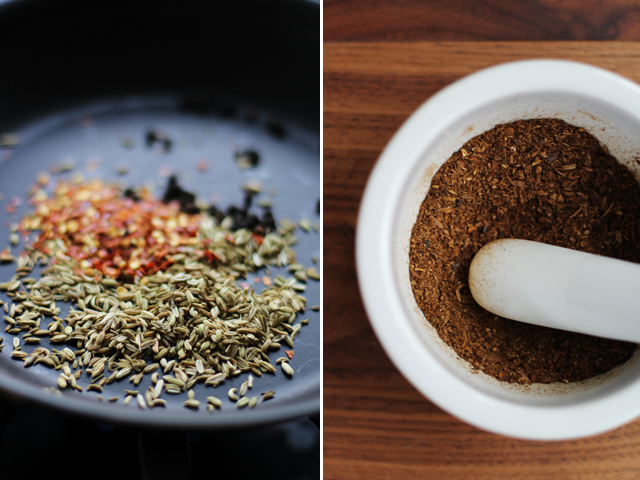 Allow the spices to cool and crush in a mortar and pestle or spice grinder. Mix in the garlic, rosemary and lemon zest. Prep the meat by placing the skin side down on a large roasting pan or baking sheet. Prick the meat all over about 1/4 inch deep so the spices penetrate the meat. Flip the meat and score the skin by making cross marks. Don’t cut too deep, only slice the skin. Using a meat mallet, tenderize the skin all over for about 3 minutes. Flip the pork, and spread 2/3 of the rosemary fennel seasoning all over. Sprinkle 1 tablespoon of kosher or sea salt on this side. Roll the porchetta so loin is on the inside of the roast. If using a separate loin, season the loin and place it in the center and wrap the belly around it. Tie tightly with butcher’s twine in 1/2 inch intervals. Season the outside with the remaining 1/3 of the rosemary-fennel seasoning. Tent loosely with foil and refrigerate overnight at least 24 hours. The next day take the porchetta out two hours before roasting. 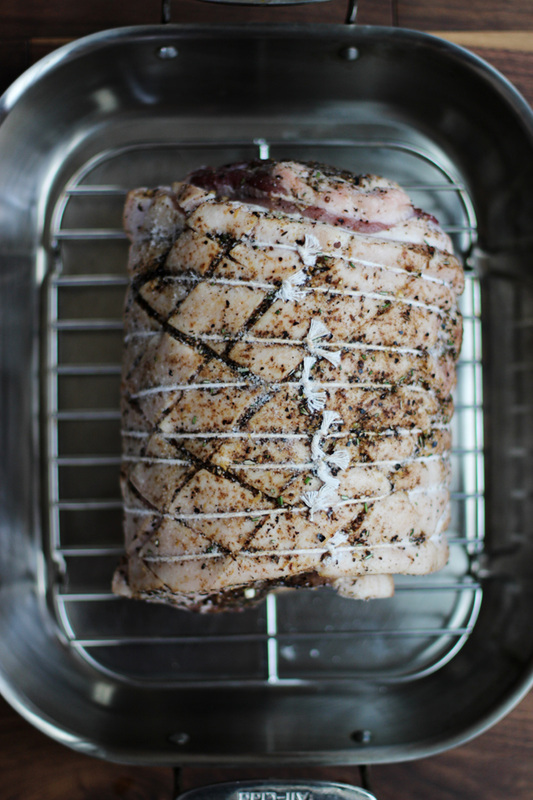 Leave the porchetta uncovered at room temperature for two hours blotting the roast with paper towels to remove any excess moisture. Season the outside liberally with salt right before roasting. Preheat oven to 500 degrees, place the roast on a roasting rack and roast for 30 minutes. (Make sure your oven is very clean because at such high temps any food will leave your kitchen smokey!) Turn the oven down to 325 degrees and roast for another 1 1/2 to 2 hours or until the meat registers to 160 degrees in the center. My 10-pound porchetta took about 1 hour and 40 minutes to reach 160 degrees after roasting for 30 minutes at 500 degrees. Warning, the temptation to pick off and snack on crunchy skin will be strong. Remove the roast and allow to rest for at least 20 minutes before slicing. Remove the string and carve into thin slices. To make the gremolata, place garlic, parsley and arugula in a food processor and process until finely chopped. Alternatively, you can mince all the ingredients with a knife. Transfer to a bowl and add lemon juice to the parsley arugula mixture. Add olive oil and add salt and pepper to taste. 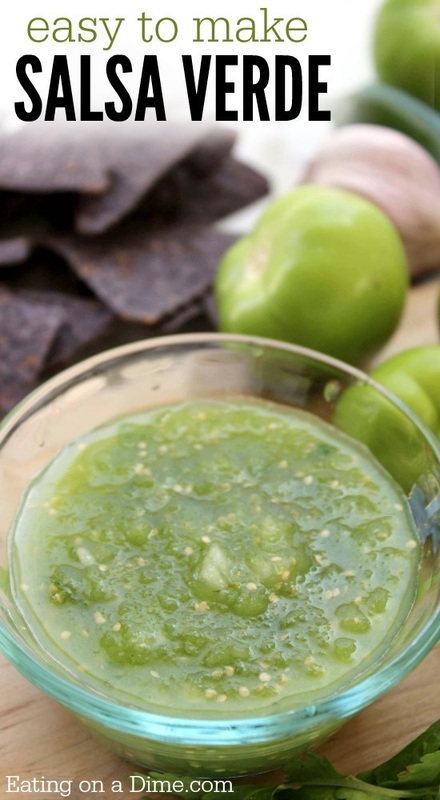 Place garlic, parsley and arugula in a food processor and process until finely chopped. Alternatively, you can mince all the ingredients with a knife. Transfer to a bowl and add lemon juice to the parsley arugula mixture. Add olive oil and add salt and pepper to taste. Drizzle the gremolata over slices of porchetta, or slather on ciabatta bread. Layer slices of porchetta on the bread and tuck pieces of crunchy skin in for the best sandwich ever. NET WT. 4 quarts per bottle.